For people with isolation quadriceps weakness, polio, post-polio, multiple sclerosis, unilateral paralysis, incomplete spinal cord injury, and some traumas, walking can be a challenge. The FreeWalk stance control knee-ankle-foot-orthosis reacts to your movement by locking the knee joint, ready for you to step forward with stability and confidence. 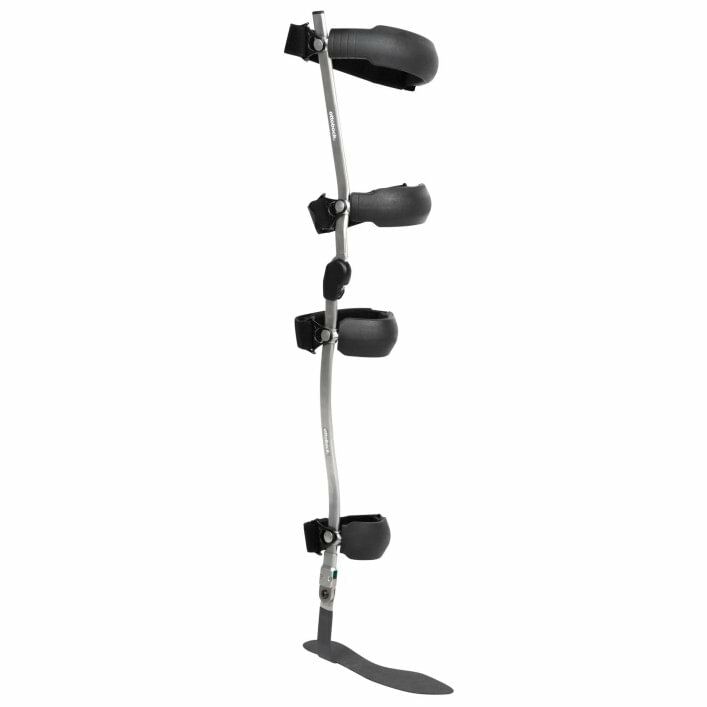 At less than 2 pounds, the FreeWalk system reduces fatigue because of its lightweight tubular stainless steel construction. And the durable open-frame design keeps you cooler than most alternatives. Automatically locks before stance (stepping) and unlocks during swing phase as you move your leg forward. The covered knee joint helps protect your clothing – and the system. The pad and strap system features a quick release hook, making it even easier to don and doff. Imagine walking with a straight leg, unable to bend the knee because of a brace—or maybe that experience is all too real for you. For people with isolated quadricep weakness, polio, post-polio, multiple sclerosis, unilateral paralysis, incomplete spinal cord injury and some traumas, stance control orthoses offer new options to explore with your orthotist. FreeWalk is a lightweight alternative to a traditional knee brace. It switches between a locked and an unlocked knee joint at the appropriate time to help keep you stable. In addition, a more natural motion makes it easy to add a few steps to your day without adding fatigue. The best way to find out more about the FreeWalk is to talk to your Orthotist. If it may improve your walking ability, your Orthotist can work with their Ottobock Sales Representative and set up an appointment for you to “test walk” a FreeWalk in the office so you can get a better sense of the difference it can make for you. Walking is a complex motion, and selecting the best brace for you will require some time with your Orthotist. Be sure to bring along the downloaded brochure to help clarify the clinical indications and other details as they relate to your unique case. Please review the detailed motion specifications with your Orthotist to determine if you are a good candidate for the FreeWalk stance control system.